Probably watching lots of films, my imagination works overtime, I love reading and films give me so much, I can lose myself in a good film . I am inspired by different authors, like JK Rowling, The Harry Potter films and books are just magical. Probably a couple of months or so, because I started writing then I would stop for a while then carry on again. I am currently writing a sequel to the Outcasts and also another called The first cut about a young girls journey through university, being different and the people she meets along her way some good and some challenging. But from her life and experiences as she grows through the university years. Yes I dealt with it by just putting it on standby then reading other stories and watching TV to give you good ideas and when you least expect it an idea will come to mind and you can just write it down, when I get ideas in my head I just have to write them down or make notes. 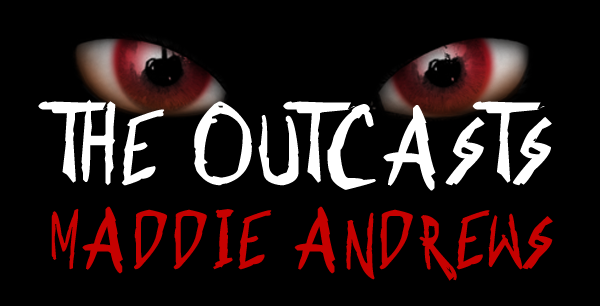 No not really because I have been writing for ages, when I was little with weird little stories that made no sense, I have written since I could, but The Outcasts is my first published. I write poems, songs and stories, even scripts for plays to act out with my friends. Just do it, really if you get an idea and write a story and if you want it published don't just worry just do it, and give it to a company see what they say and get it published don't just sit there and hope it magically gets published by its self. To see your words in a book and others to read it is amazing and having the opportunity to share your adventures and characters you have created with others is just special. Anything is possible, follow your dreams. It was easy, and Laura and Camilla gave advice and helped me along the way, it didn't take long and the outcome was just how I had imagined, just perfect, I had to choose the cover, they offered some other ideas, but I liked my own design with a bit of touching up, they double checked my spelling and grammar checked for any mistakes and it took a few weeks but it was fun and I'm glad other people can hopefully read and enjoy it. To see my words in print like a book in the library, or shop and to see on Amazon WWW and being able to buy it is WOW, a wonderful feeling. Descriptive and exciting ! By Samantha Stradins on 20 Jun. 2015 Wow! Very hard to believe that this was written by such a young author. Very descriptive and well written. This would appeal to both younger and older readers. Looking forward to more material from this talented young writer. Sam Gifted and Talented By Rachel on 18 Jun. 2015 Verified Purchase On reading this book I would not have said it has been written by someone whose 11 years old. She really is a very talented young lady who has a gift and an imagination to get you hooked. I enjoyed the book so much that I couldn't put it down. She has left me wanting more as I want to know what is going to happen next. I would recommend this book to anyone young or old. 1 of 1 people found the following review helpful An exciting, thrilling read. By Mrs C Coates on 18 Jun. 2015 A fantastic book that will appeal to young and old. Credit to the brilliant young author, a very talented young lady. I was totally hooked and couldn't put the book down! A must read for anyone.